Year 2 have been looking at maps and understanding directions and procedural language for their Unit of Inquiry. Today, some students put this knowledge into practice using the Beebots and the maps we have purchased. 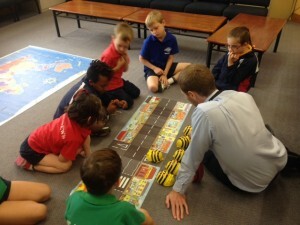 This entry was posted in 21st century learning, Differentiated Learning, Digital Technologies, Digital Technologies, ICT and tagged beebots, Literacy rotations, Year 2. Bookmark the permalink.